Here in the United States, we are celebrating Independence Day! I thought it was the perfect time to write about my favorite patriotic quilt. 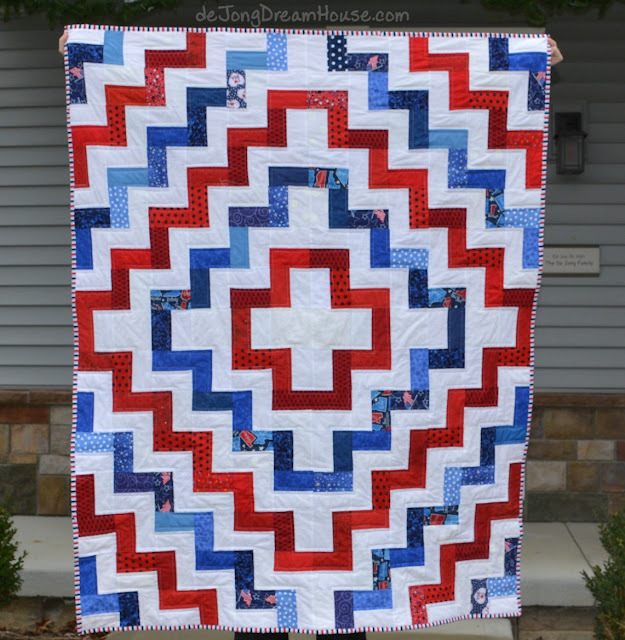 This Patriotic Plus quilt was finished in December of 2014. I made it as part of my church's quilt ministry and I hope it is warming up a deserving veteran. Inspiration for this pattern came from Marit at Quilt It's Fractured Field Study #2. Marit was inspired by Kathy Doughty of Material Obsession, but I'm not sure which quilt started this parade. This quilt was made entirely from scraps in my overflowing scrap bins. Apparently I didn't take many photos of the process of making this one. Then again, it was 2 years ago, so it's also possible that I filed the photos in a special place I will find sometime after I share this post. But from this picture you can see that the blocks are made of 2.5" x 4.5" rectangles sewn into squares. It was really easy and fun to assemble. I planned the layout using the portable design wall I bought at the International Quilt Festival in Houston that October. I really love it, but alas, it doesn't work too well in our narrow laundry room or narrower hallway. (This is my reminder to offer it for sale on one of my Facebook quilter sale pages!). This is also when I was creating my quilt display in my craft room. Happy Independence Day everyone! Stay safe and watch your fingers! I love the way the rings of colour radiate out from the centre in this quilt. Red white and blue is such a beautiful colour combination isn't it. The house is interesting as well...My husband works for an environmental builder. This was the first scrappy quilt I made from my own scraps. Seeing each piece individually, I was unsure that I would like it all together, but it's become one of my favorites! We've been in our house for 4 years now and just love it. Especially the low energy bills! I love the design. It looks so fresh and modern. It really is a cool, cool quilt. It would be neat in any iteration, but I love the r,w &blue you did! Great job. This is a perfect quilt for the 4th. Love the red white and lbue. A great red white and blue quilt for this time of year! What a great quilt! It makes me happy to know that it was given to a veteran, too. Such dynamic beauty from scraps, amazing! Love everything about this quilt: colors, pattern, the fresh look. Great! This very quilt has been in my head lately! Now I have to get it sewn but I think I will make mine improv. Thanks for inspiring me and sharing with Oh Scrap! Another quilt that warms someone's heart. :-) I like how crisp and fresh it looks. I love the scrappy look of this quilt. It would work in all kinds of color ways.